A Big, Phat 'Rhapsody In Blue' As is true for so many great musicians, the compositions of George Gershwin live on well after his death. Case in point: Jazz musician Gordon Goodwin has arranged Gershwin's beloved piece for his brassy Big Phat Band. Gordon Goodwin arranged "Rhapsody In Blue" for his Big Phat Band. When one of this country's greatest composers died at age 39, novelist John O'Hara said, "George Gershwin died on July 11, 1937. But I don't have to believe it if I don't want to." As is true for so many top musicians, Gershwin's works — his popular songs, his opera Porgy and Bess, his jazz-informed classical compositions — live on. Now, there's a new version of one of Gershwin's best-loved orchestral pieces, arranged for a brassy big band. The beloved "Rhapsody in Blue" opens with a familiar clarinet glissando. 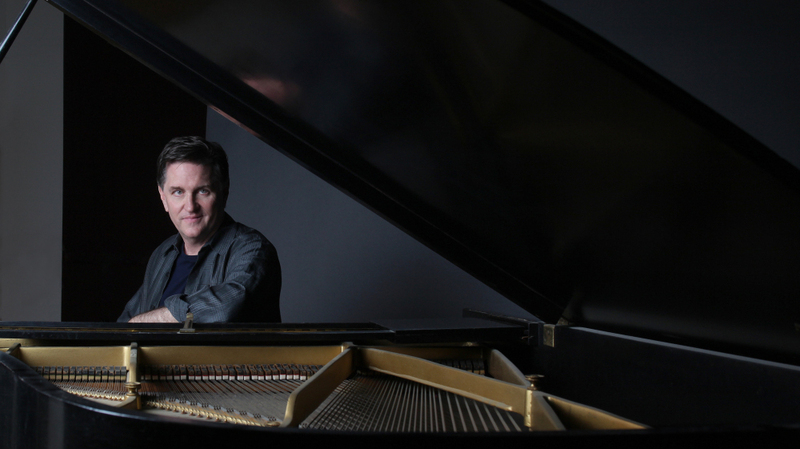 "There's nowhere to hide with this," pianist, saxophonist and composer Gordon Goodwin says. "It's one of the reasons, by the way, that my clarinet sits in the closet unused for 10 years now, because I will not deal with that beast." But Gordon Goodwin did deal with Gershwin's "Rhapsody in Blue," by rearranging it for his Big Phat Band. Gershwin wrote his "Rhapsody" in three weeks. He'd read in the paper that bandleader Paul Whiteman was including a Gershwin "jazz concerto" in his landmark 1924 "An Experiment in Modern Music" concert at Aeolian Hall in New York. It was news to Gershwin, so he hustled. Gordon Goodwin did his big-band arrangement in only two days — talk about hustle. But for a Gershwin tribute at Walt Disney Concert Hall in Los Angeles, he was given only a five-minute slot. "That told me that I really couldn't get too esoteric or come up with something that would take too long to put together," Goodwin says. "I mean, I've heard this thing hundreds of times. I have such great respect for it. The construction of it compositionally is just so right, I didn't feel it was appropriate for me to go in and reinvent the wheel so that it strays too far from what Gershwin's intent was. "I don't write a lot of slow songs for the big band, because I think horns are a poor substitute for a lush string section," he says. "But this was an exception, this particular melody, and it's one of the only ballads we play." With his arrangement, Goodwin's band makes vibrato without strings. In another section, he pumps it with brass and sets it to swing. "Right, well, we definitely took this theme and put it in a 1950s Count Basie, you know, groove," Goodwin says. "And also maybe a little bit of Quincy Jones and Sammy Nestico. That melody just slid into that groove with very little effort." Remember that impossible three-week deadline Gershwin faced? In her book Fascinating Rhythm, biographer Deena Rosenberg says the composer, working against time, left a lot of pages in his manuscript blank. Gershwin decided that, since he was the piano soloist for the "Rhapsody" premiere, he'd just improvise those sections. For the rest, he handed what he'd written over to Ferde Grofe — one of orchestra leader Paul Whiteman's favorite arrangers. Grofe parceled Gershwin's notes out to 18 musicians (who played a total of 23 instruments). Two years after the premiere, Grofe re-orchestrated the "Rhapsody." That version is the one we've come to know. So what would Gershwin and Grofe say about this arrangement? Are they spinning or swinging in their graves? "I could only hope, you know, that they wouldn't be disgusted by what we did," Goodwin says. "You know, it's just a great pleasure and honor to be involved with such a great piece of music. ... With all due respect to Aaron Copland and to Duke Ellington, this is America's greatest composer, and I don't think there are any other contenders." Gordon Goodwin's Big Phat Band plays this arrangement of George Gershwin's "Rhapsody in Blue" on its newest album, That's How We Roll.